We're all about Recreational Shopping! We’re on Winter High Season Hours! Fridays, Saturdays, and Sundays 7am to 4pm. Parking is free, admission is free, and great live music at the Food Court is also free! And by the way, we love animals, too… but so sorry, we only are allowed to have ‘Assistive Animals’ on Mesa Market Place property. 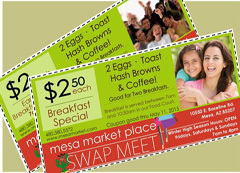 Come enjoy ‘Recreational Shopping’ at Mesa Market Place Swap Meet! Admission is FREE! Parking is FREE! And Live Entertainment in our Food Court is also FREE! Take a minute and visit our Coupon Page. You’ll find our Market Breakfast Coupons there! Print them out or show them to the Cashier on your smartphone so you can start your day with a good breakfast: Two Eggs, Toast and Hash Browns for either $2 or $2.50, depending on whether or not you’re an early bird! 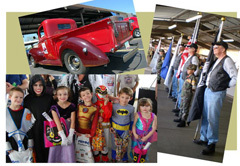 Welcome to Mesa Market Place Swap Meet! Ready for a fun day? Mesa Market Place Swap Meet is here for you. And if you need mobility, click here for more info including location and rental prices. In Early Winter Season, we’re open Fridays, Saturdays and Sundays, from 7am to 3pm. In Spring Season, we’re open Fridays, Saturdays, and Sundays, from 7am to 3pm.In Early Summer Season, we’re open Fridays 7am to 2pm & Saturdays and Sundays 7am to 3pm.